Vakilsearch, an online legal service provider based from India, takes one step forward by launching its very own cloud-based legal practice management software called LIBRA, with the aim of providing a one-stop solution to all legal practitioners and help them get in par with the digitalised world. LIBRA has helped lawyers to ditch their traditional methods and get digitalised. This platform was designed to equip all the necessary requirements of a lawyer and help them work more efficiently. LIBRA is a web-enabled Software as a Service (SaaS) application that targets the individual lawyers and small law firms who need expertise in case management, court schedule, trademark search, research and regular news updates. LIBRA is the only online legal platform that has succeeded in bringing numerous legal professionals together, in spite of how minutely the legal fraternity might have fragmented in India. The software is built in such a way to address issues of both litigating and non-litigating lawyers. With all things said, why should a lawyer use LIBRA anyways? Time Management: Regardless of whether you are a litigating lawyer or a non-litigating lawyer, managing time is a great task. This app, however, helps in tracking time and managing the time available effectively. It keeps notifying the user about the future appointments and hearings promptly, allowing the lawyers to not miss out on anything that is a part of their schedule. Live Causelist: For practising lawyers, finding the present case, being heard and managing to be there on time to present their case is a great problem. LIBRA eliminates this hardship by updating a live display board of the court in your smartphones that could be accessed from anywhere. This helps mitigate any mishaps with regards to being in the courtroom on time for the hearing. All Cases Database: Legal research is a crucial part of taking up a case and finding the relevant material for research amongst all those plethoras of cases and judgements is an endeavour. LIBRA acts as one-point access for upto 1.5 million judgements powered by AIR. These plethora of cases are also available with footnotes and short notes for the convenience of the multitude of users. This makes the research process easier, more convenient and less time consuming which could be used to counsel the clients. Ledger Facilities: Managing the income and expenses as a lawyer could be tedious and there is a great chance of missing out on a few of the transactions amidst the busy schedule. LIBRA app has a ledger that could keep a record of all the expenses and the incomes, all in a single snapshot. The transactions are also recorded timely to allow the lawyer to look back into the time, date, mode, place, etc. of the transactions. Organizer: The worst nightmare of every legal professional is organizing the files and documents properly. It needs to be sorted appropriately in such a way that it could be easily taken out whenever needed without any hassles. Most of the time, it is a highly impossible task to achieve and everything just keeps piling up as a mess. This could be rectified by storing all the necessary documents in secure cloud space. All data can be assorted and easily accessed whenever required. Activity Log: The app helps track all recent activities like the cases that you referred, judgements that are related to the search options, and also take notes on the same app. Making instant notes and commentaries would be useful for future references and hence help the lawyer to focus on the task in hand rather than searching for where the previous notes were made. This way, the lawyer could keep all the activities in check at all times. It allows the user to mitigate the difficulty of finding where the file that you referred to in the past is located at. Secured Digitised Storage Space: LIBRA has a 10 GB cloud storage space that could be used to save all the digitised documents. This vault can be used to store and also retrieve the documents feasibly at any given time. There is no risk of losing data due to the highly encrypted nature of the vault. It could be used to store information about valuable criminal data making FIR and criminal records of any person online. Legal News and Blogs: The software has an abundance of legal news and updates available for their disposal. LIBRA also publishes legal blogs focusing on various legal fields and issues periodically, which are highly informative. 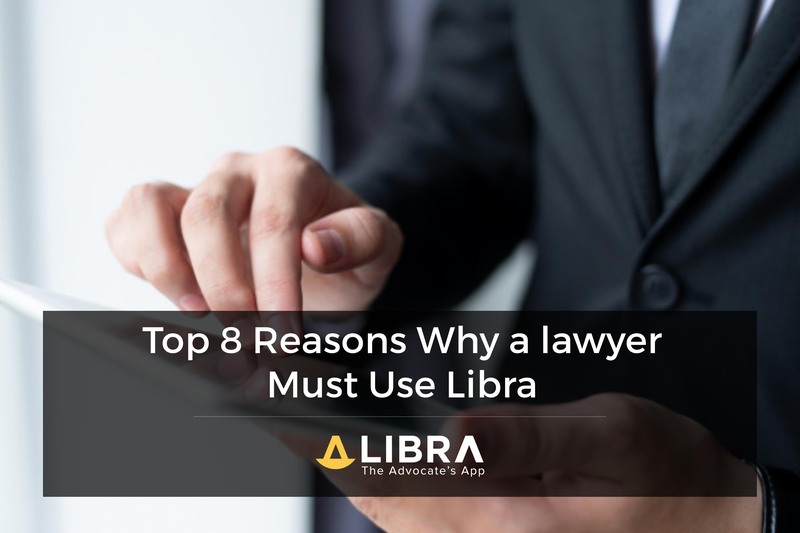 LIBRA is a great mode for lawyers to understand the existing systems of laws and evolving from the customary legal pen and paper methods to a digitalised way of functioning. It would help save a lot of time that could otherwise be used for many other productive works.